Whether you have storage needs or want to add a more modern look to your kitchen with a durable and easy to clean surface, stainless steel cabinets are the best solution. Your bathroom, work shop, garage, pool house, or outdoor kitchen can have stainless steel cabinets installed for optimal storage use. Outdoor conditions do not affect stainless steel and not even children will be able to damage the material. This makes it perfect for people whose cabinets are prone to damage. They are not only resistant to chips and fading but cannot be harmed by termites, smoke, or flooding. Stainless steel cabinets never have to be replaced, resurfaced, or re-stained and you no longer have to worry about peeling or chipped paint. The list of benefits for installing stainless steel cabinets in your home or business continues to grow. You can stay up to par with restaurant health codes while looking as sleek as any business. Stainless steel’s non-porous surface does not absorb any substances and all germs and mold can be easily cleaned away. Behr Enterprise fabricators have the expertise and experience to custom make your cabinets, perfectly measured and designed to fit your desired space. 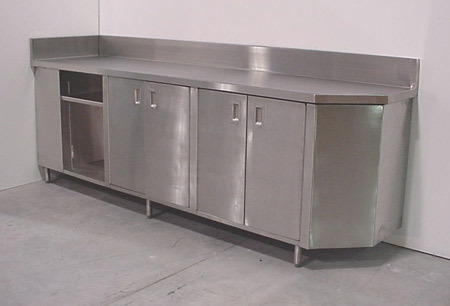 Custom fabrication ensures you are getting the highest quality stainless steel cabinets available. Keep your home and business clean with our extremely durable stainless steel cabinets. Stainless Steel can handle whatever you throw at it, making it the best cabinet application for any space. Stainless steel is made of non-porous material which cannot be penetrated by air, water or other fluids, giving it the ability to combat rust. Stainless steel can also be alloyed with any of the following elements: chromium, molybdenum, nickel, aluminum, carbon, silicon, columbium, copper, manganese, and titanium. Each element effects the composition of stainless steel in a different way, its resistance to corrosion, oxidation at high temperatures, and abrasion; appearance, strength, and ductility at elevated and cryogenic temperatures. The element used will determine which grade of steel it is, either martensitic, ferritic, duplex, precipitation hardening, or austenitic stainless steel. Most food processing equipment is made from austenitic stainless steel. Due to the composition mixture, stainless steel cabinets can withstand and endure just about any climatic environment. For the best stainless steel cabinets, made from the best materials, and produced by the best metal fabricators, choose Behr Enterprises. Contact The Stainless Steel Cabinet Fabricators At Behr To Learn More About Our Custom Stainless Steel Work.